Couldn't agree more about the John Peel comments in newsletter - I know it sounds corny but my career ambition is to get into radio and he was my inspiration. I just hope that the impact of his death and legacy will influence radio to be more flexible with uncommercial music. 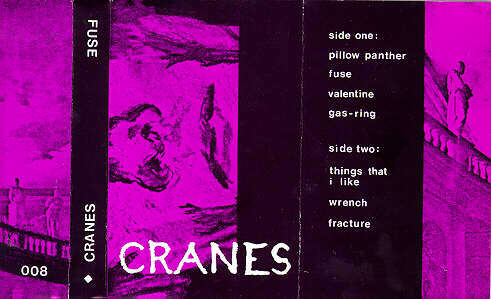 Also - I had NO idea that the Cranes had recorded a session with John Peel - does anyone have any more information on this or a recording of this? Was it ever available to buy etc.. Is this something the website could make available to download if the material is still available? That would be "heaven or bliss" having John Peel and Cranes playing songs from 'Self Non Self' especially as it is my favourite album! Posted: Fri Feb 18, 2005 8:53 am Post subject: Yes its true! Sorry, I seem to be replying to this ALONG time later.. Yes we actually recorded 2 Peel sessions. One was very early on and was versions of what was later to become the first EP. As of now I cant precisely remember what the secont session was.. apart from a somewhat odd version of Inescapable.... Hmm Now Im not sure about the first sesh either.. did we do Starblood.. I think so.. and Dada 331.. AND I think there was a track that we were gonna do, but ran out of time cos Jims Simmons Drum Pads would not work .. just maybe it was.. nope forgotton.. gonna have to go thrue my box of old tapes and see if I can find it! Main disapointment was that we never actually got to meet the great man... I cried when I heard.. anyone read the Mick Wall book? Its a cash in--- but great! I can't believe you never got to meet him - that's such a shame but at least you were part of the legacy - the man's a God in my book. If you do dig out your old tapes and find the sessions let us know, would love to know the setlist or hear them?! It had an absolutely awesome version of 'Starblood' - an order of magnitude better than the album version. I'll try to find this thing and let you know. It's like - 15 years old so hopefully it won't simply disintegrate when I try to play it. THANK YOU, THANK YOU, THANK YOU - KEEP ME POSTED. today i received a cd with the 2 John Peel sessions. i have had these sessions on tape since 1992, and now a friend of mine has cleaned them up and put them on cd. they are brilliant, the quality isn't that good, but i'm still very happy. i can now finally listen to Til Tomorrow whenever i want. will these sessions (perhaps together with the 1994 Radcliffe session) ever be released on cd, since a lot of bands are releasing their BBC sessions??? everyone gets a copy if they ask (and ALI and JIM don't mind)!!! by the way: did you get your copy A??? Is there really no-one that wants a copy??????????? Am I really the only one keeping this forum alive?